Five Russian startups – the winners of the Startup Challenge accelerator organised jointly by the Skolkovo Foundation and multinational pharma giant AstraZeneca –were showcasing their inventions at the International Future Healthcare Forum in the British city of Cambridge on December 3 and 4. The five Russian teams presented their projects to experts and mentors from AstraZeneca’s headquarters in Cambridge, along with representatives of leading accelerators and Cambridge scientists. The five companies were selected to take part in the accelerator back in July. The joint AstraZeneca-Skolkoov accelerator – the first of its kind – was aimed at teams developing innovative solutions for treating cancer, cardiovascular, respiratory and autoimmune illnesses, and metabolic and kidney disease. The companies that won places on the accelerator programme got the chance to work with mentors from AstraZeneca and the opportunity to use the Sk BioLab hack space in the Skolkovo Technopark, as well as undergoing business training supervised by leading specialists at AstraZeneca. The startups that weren’t residents of the Skolkovo Foundation at the time of winning a place on the accelerator have since obtained resident status, entitling them to apply for a minigrant of up to 5 million rubles ($75,000). 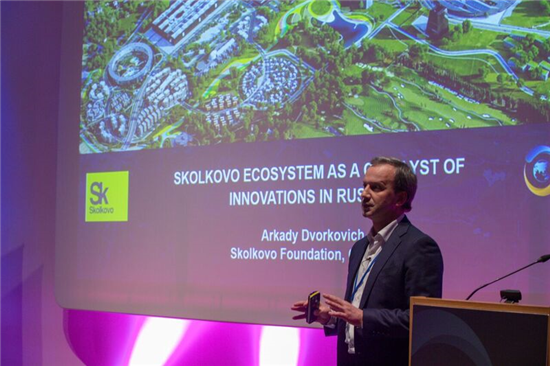 “The event in Cambridge has primarily scientific significance, but in the event of success, taking part in the forum will help the Skolkovo startups to achieve success in business too,” said Kamila Zarubina, director of acceleration within the Skolkovo Foundation’s biomed cluster.